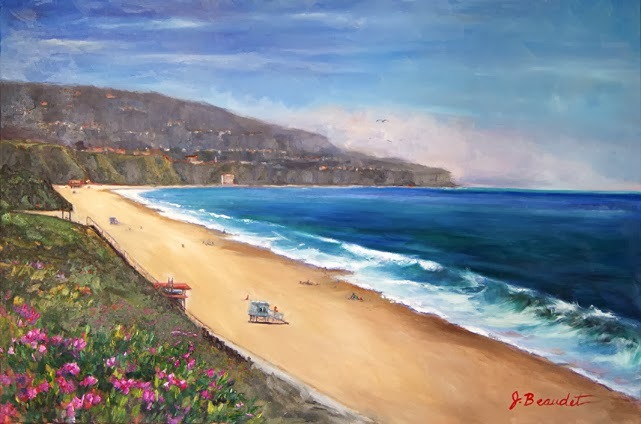 Jen Beaudet Art: Finished my Palos Verdes, California Coastal Painting! Finished my Palos Verdes, California Coastal Painting! I'm not used to painting this large and it taking so much time. I tried to rush it posting my progress everyday, which I will continue to do. However, I need to take a step back, give it a few days before I post it for sale. I ended up making a few changes to make the diagonal lines less prominent by adding some curves. Sometimes when I'm not sure of what to change, I go to my favorite workshop site, Richard Robinson's The Complete Artist. The people on there are always helpful and sometimes, if I'm lucky, I get input from Richard, himself! Michael Severin, is so knowledgeable about painting and design, I always learn something from his help! Love the changes between this and last version. Much more movement in the sea is great. Jennifer, I think you nailed it. Is this plein aire? and are you using acrylics and/or oils? Thank you Arthur! It means a lot to me! I did this one from reference photos but I think I'll be visiting in a few weeks and would love to paint some plein air! There's so much inspiration there! I will definitely use a smaller canvas though! It's so vibrant and beautiful Jennifer...you captured the vastness of the ocean. Jennifer it has turned out lovely! Good idea about waiting a bit before posting for sale. It help discover some of the things we missed the 1st time around. I just wish I was there...period! Want to be on that beach! I like how in the very far distance, it almost looks a little coastal-foggy which is what often seems to hang off our SoCal coastline. And you really got it down on the waves breaking toward the sandline. What an absolutely gorgeous painting; I wish you could just keep it for yourself! It's a keeper/keepsake.